A.M. Lots of training partners this morning. Ran with Ted and James the first 7 miles in 54:17. Then 3 more just with Ted in 21:01. Joined James in his kick, and caught Ted after a VPB stop, that gave me some marathon pace running. Ran some more afterwards. Was originally planning on adding 3.11 so I would be at half-marathon distance for my morning run, but then I saw my old friend and training partner Matt Anderson, and added a bit with him. Matt and I have run a lot of miles together. He has been out and about getting a lot of education, and now is back, teaching math at BYU, 400 and 500 level classes. He is 31, and still single. He has been running the entire time, though, and looks like a teenager. I teased him that if he showed up at a high school dance, he could have some success as the girls would have no idea about his age. Maybe that's the problem - the girls that are old enough to marry think that he is too young to date them. 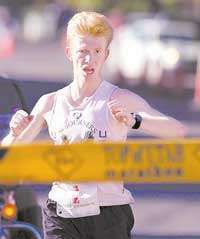 When I told Matt that I ran 2:23 in St. George, he responded correctly to it right away without being prompted - bummer! I guess reaching any goal is similar to writing a program. At first it does not compile with a lot of error message. Then you fix some and try again. Get even more error messages. Then you finally fix them all, it compiles. You are ready to celebrate, but you know better if you are a programmer with experience. You try to run it, it dumps core on a trivial test. You fix that. Then it produces terribly incorrect output on a trivial test case. Fix that. Then incorrect output on a less trivial test case. Then it finally works correctly on all of your test cases. Then you give it to the users. They start reporting bugs. Finally you think you've fixed them all. Then a month later you get an ugly bug report. So on and so forth. It is incremental progress with frequent failures, but you are becoming better and better one step at a time. We ran to my house, finished 13.3 in 1:38:20. Then Matt gave Benjamin some math problems, Benjamin solved all of them except this one - what is the limit of sin(1/x) as x approaches 0? This one challenged me as well, although it should not have, but I was too lazy to think and asked Matt the answer. This turned out to be a trick question - the limit does not exist, the sine function diverges as the argument approaches infinity. I also asked Matt about the equation on my shirt. I understand the front part, which says, "and God said", then Maxwell's electromagnetic equations, then "and there was light". The back part says, What part of - some ugly looking partial differential equation - do you not understand? Turned out to be something from the quantum mechanics, which is what I thought it was. The discussion, however, stirred up Benjamin's interest in math, which is very good. I'll keep bugging Matt about Fast Running Blog until he joins. P.M. 1.05 with Julia in 10:33 in the early afternoon. Later, 2 miles with Benjamin, Jenny ran the first 1.5, then rode in the stroller. Jenny's time was 14:14. Benjamin finished 2 miles in 17:47. He put some hot pepper on my plate with the last quarter in 1:38. With Jenny in the stroller I had to move my legs to keep up, this was almost marathon race pace effort. Ran 2 miles afterwards with Jacob and Joseph in the stroller in 14:38. A.M. Big Workout. Ran with Ted and Jeff at 5:00 AM. Warmed up a bit over 6 miles. Made two VPB stops, catching up gave me a mile of marathon pace running. Good warm up for the tempo. Then ran 7.5 tempo. Did not have a time goal, just went by feel. Did not check my splits as often as I normally do, at times going for as long as 1.5 without checking a split, that is not normal for me. I get bored when I cannot check my splits often, and lose concentration. I think for some people it is a good idea to run watchless and splitless. For me it is not, my mind starts to wonder and I lose concentration. Even with the splits every quarter I still cannot push myself hard enough in a marathon to make me sore afterwards, which I take as a sign that the muscles have more to give, but the nervous system quits early. Without the splits I go into a complete slack off mode, especially in the dark. First 2.5 (slight net up) was 14:23. On the second one, which is a slight net down, I fell asleep, and ran 14:30, 28:53 at 5 miles. Woke up a bit on the last 2.5 and ran it in 14:21. Total time for 7.5 was 43:14, average of 5:45.87. Cooled down to the house, total time for 15.1 was 1:39:40, 6:36.03 average (computed precisely using the new feature in the calculator on the Add Entry page). Does anybody have ideas on what to do when the nervous system lags behind the rest of the body? I found that sleep, lack of stress, and frequent carbo-rich meals are helpful. Any other ideas? Sarah did a 2 mile tempo run in 15:51. This is a good time for her. However Benjamin was quick to give a very humble response - this is still far away from my 13:57! P.M. 1.05 with Julia in 9:14. This converts to an 8:48 mile en-route, new mile PR for her. Benjamin and Jenny could not crack 9:00 until they were almost 5.5. Julia is not even a month over 5, and mentally she is much younger than Benjamin and Jenny were at her age - both were reading by that age, Julia is still probably at least couple of months from being able to read. Which means, from what I have observed in my kids, that she would have a harder time getting what her true fitness would give her. She has shown the most talent out of our running kids so far. Then ran 0.99 to pick up Jenny from her tumbling class in 7:45. Took a scenic route with Jenny, 1.74 in 14:57, 8:34 average pace. Then it was Benjamin's turn. I told him he had to beat Mommy's tempo run time of 15:51 for 2 miles to validate his bragging rights. He warmed up the first 0.5 in 4:13, then cranked it up a bit and hit the mile in 8:05 vs 7:55 Mommy split. However, he passed Mommy on the next quarter hitting it in 1:50. This was followed by 1:47, and 1:50. Now his bragging rights were secure, except I told him he could not close slower than Mommy (1:52). So he ran the last quarter in 1:46, finishing 2 miles in 15:19 with the last mile in 7:14. Pushed Jacob in the single stroller throughout the entire evening run adventure. Total of 5.78 miles. A.M. Early morning run with Ted (5 AM). Started slow as usual, then gradually eased into 7:10 - 7:20 pace. With about 0.3 to go Ted's horses began to neigh and he let them loose. So we ended up going through all the gears of the semi, and finished at my 5 K race pace, or maybe even faster. Last quarter was 1:19, total time for 10.1 was 1:12:50, average of 7:12.67. P.M. 1.5 with Jenny in 14:20, 2 with Benjamin in 16:10, 1.05 with Julia in 10:24, then 2.5 in 17:23 by myself. No stroller. A.M. Moderate workout. 6:30 AM by myself. Temperature around freezing. Warmed up 4.12 in 29:43 to the trail gate by the Utah Lake. Then ran Provo River 5 Mile Tempo except started at the other end of the stretch. Figured it would work better for teaching me to negative split since that makes the first half a slight up, and the second slight down. It worked quite well. I hit the first mile in 5:40. It was still dark. The pace felt just right. I adjusted for the cold, leaves on the road, post-marathon residual fatigue, and a recent increase in mileage. So although it was slow, I was expecting to hit slower splits with more effort. Started to get into a good rhythm on the next 0.5, ran it in 2:47. Then hit the uphill section, and it took the wind out of my sails. Dragged myself through the next mile in 5:40 with 14:07 at 2.5. My legs felt like they were stuck in a low gear. The way things were going, it looked I was headed for about 28:05. I began to wonder if the marathon, and the sickness before it perhaps took more out of me than I thought, or maybe I was just underestimating the effect of the cold weather and the leaves on the road creating slippage. Next quarter was 1:27 recovering from 180 turn, followed by 1:24, a bit of an encouragement. This gave me 16:58 at 3 miles. Then the sun came up, it started getting warmer, and I hit the downhill section. This kicked me into gear. Next mile in 5:28, and the last one in 5:26 with the last quarter in 1:19. Total time 27:52, last 2.5 in 13:45. While the time was not particularly fast, nor were any of the splits in the middle, I was happy with being able to find myself not feeling that great half way through, yet still be able to run a 22 second actual negative split, which translates into a 15 second effective negative split adjusting for the profile of the course. Then ran 3.88 in 26:51 back to the house. This gave me 1:24:26 for 13 miles, 6:29.69 average. P.M. 2 miles with Benjamin in 16:11. Tested his sense of pace - did not give him any splits until we were done, and had him estimate every quarter. He was fairly consistently off by 5-10 seconds guessing a slower pace that he was actually running. Then 1.05 with Jenny and Julia in 10:29, and another 0.5 with Jenny in 4:32. Then 1.5 by myself in 10:24. No stroller today. The good news is that while in the late morning and early afternoon I was feeling like I had done something, by tonight I started to feel like a slacker. Not bad at all after 74 miles in 4 days. A.M. Easy 13.11 with Ted at 6:30 AM. Ran from my house to the Sasha House 10 Miler turnaround, then back, added extra miles on the trail. Did 8x100 strides, all around 18-19 seconds. Felt good. Total time for 13.11 was 1:35:31. Pace varied from slower than 8:00 in the early miles to 6:40-6:50 towards the end. The morning it just hit me that I remember way too much for feeling like a teenager, and have way too many kids for feeling that way for sure. Just to think that when Jeff was born, I had already run 3000 in 10:08, and a 10 K on the roads in 37:38, and now Jeff is running with me, and he does not look any different than me. Yet I am almost old enough to be his dad. That is odd for sure. But have no complaints about faster times on all distances, and faster recoveries than back in the teenage years. P.M. Started with a double stroller and two kids in it - Jacob, and Leland, our bishop's little daughter. We were babysitting for him and his wife tonight. 1.5 with Jenny in 14:32, then 2 with Benjamin in 16:59. Then changed to a single stroller and a bigger kid in it - Ashton, and ran 0.5 in 3:48. Then another mile without a stroller in 7:01.